Electric transportation devices are all the rage these days, whether it is hoverboards, electric scooters, Segways or more. Some might say that soon enough they’re going to replace bicycles altogether. If you’re still a bicycle user yourself and want to stay that way, but also want to get in on the electric action then we have good news. Below we will be discussing four great electric bike conversion kits. We’ll go in-depth into each one’s unique advantages as well as provide some tips for newcomers in the form of a buyer’s guide and some words on installation. Here’s how to turn your bike into an electric bicycle. Why Should I Get an Electric Bicycle Conversion Kit? Perhaps you may already be asking yourself what the point of having an electric bike is if electric or motorized vehicles are already on the market. The simple truth is that many electric vehicles are often too expensive for some people, or they just aren’t portable enough. There could be any number of reasons why people don’t want to give up their bikes. Electric bike conversion kits are notably cheaper than going for a total replacement as well. And contrary to many people’s initial beliefs, they are not complicated or difficult to install. An electric bike offers a lot of benefits to current bike owners and riders. Not only can you see an increase in speed with minimal effort, but some kits also come with an included LCD screen monitor. Depending on the brand, it can act as a mini control center or just a simple way to display stats like a speedometer or battery life. To sum it all up, a conversion kit is often an affordable and easy way to modernize your bicycle and bring it into the 21st century. All the technological conveniences of other electric or motorized scooters can finally be yours too. Imagine not having to pedal up hills but being able to freely use the pedals on flat ground if you want to, for example. That’s how it can work, and it’s definitely convenient if you live in a hilly area. You could also just use the throttle all the time and never have to pedal, which is probably how most people will end up using it. They’re definitely fun either way. Now that we know what makes a conversion kit so handy it’s time to figure out how to select one for purchase. Any good conversion kit should come with several useful features or items. First thing is first: battery. You want a lithium-ion battery that has a good lifespan and one that has a reasonable charge time. Most bike conversion kits come without a battery, which you will need to buy separately. Next, you want to make sure the system is waterproof or at least water resistant. Usually, the back wheel is where you’ll be performing your modifications and connecting wires and the battery. Some kits are designed for front wheel modification and some allow you to choose. Either way, you will want to make sure all these components will survive some rainfall and puddles. Speed is also very important as each battery and kit will have different limitations. Some will allow you to go up to 30 miles per hour. Some more, some less, but make sure to choose one that will satisfy whatever speeds you are looking for. Pay attention to maximum load capacities as well. Some bike kits have a weight limit of 180 pounds and someone who weighs 200 pounds will have to find a conversion kit that will suit their body type. LCD monitors aren’t necessary, but they are a great benefit. 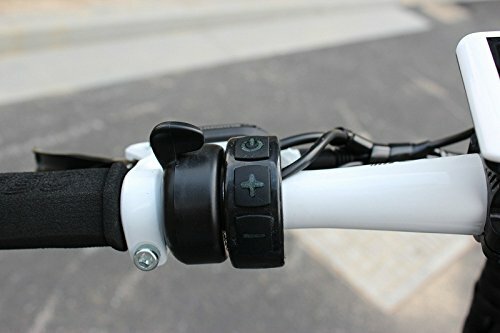 They’re lightweight and easy to hook onto the handlebars and can provide a lot of information or control to improve your experience. We recommend taking these components seriously. Not all electric bicycle conversion kits come with brakes so if you don’t want to buy those separately then you’ll need to make sure it comes included. As mentioned earlier, the installation process of these conversion kits is much easier than people always assume. Every kit will come with a manual that provides detailed instructions in a step by step fashion. Most kits will take roughly one hour to complete. 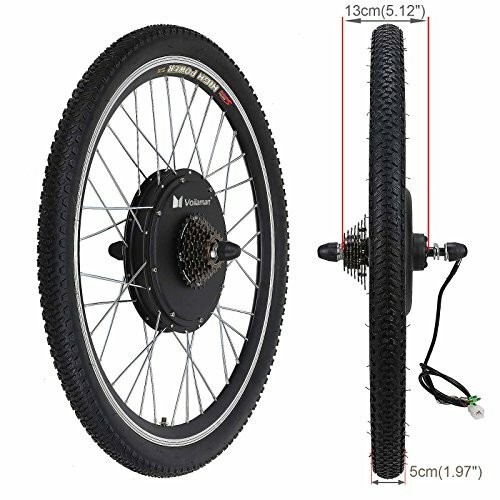 The gist of an electric bike conversion kit installation is exchanging the bike tire or rim with the one provided by your kit and connecting it to the provided battery. Most kits will provide a water-resistant carrying case for the battery that can be attached to the bicycle frame right next to or above the rear tire. You’ll be provided with the right straps or grip tape to make sure it is secured to the frame. Just remember: don’t get overwhelmed by the number of wires you see. It is actually pretty straightforward connecting them all to their correct locations as long as you follow the instructions provided by your kit. Within an hour your bike will be upgraded and its true potential will finally be unlocked. The Voilamart eBike Conversion Kit is an affordable option for anyone that wants the flexibility of choosing your own battery pack. Our first conversion kit is made by Voilamart. 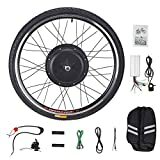 This is a rear wheel kit only, that comes included with its own brake levers, an LCD monitor, a carrying case for the battery and more. This kit has an impressive max load capacity of 440 pounds, which massively expands the range of potential users. The max speed is 28 miles per hour which isn’t anything too fast but should be able to satisfy many users. Voilamart’s conversion kit also has a function to switch from 1000w to 750w. This will alternate the maximum speed from 28mph to 24mph should someone ever need it. The carrying case is quite nice and fits the battery perfectly. Three straps are included that are directly sewn into the bag so you don’t have to deal with any fumbling detachments. The bag itself is made from water-resistant fabric and doesn’t rock around when the bike is in motion, keeping the controller in a very secure position. Arguably the worst thing about this set is that it doesn’t come included with a battery. You will have to use or find your own to power this kit or your bike won’t be going anywhere. The good news about this setback is that this setup will use a wide variety of voltages. Voilamart recommends a 48v pack but anything else within the range of 24, 36, 60 and even 72 volts will work fine. Speaking of the batteries, this kit has great mileage so to speak. The battery life is excellent even with voltages that aren’t 48v. It’s hard to get a sense of what the general charging time is because everyone uses different batteries and chargers but it shouldn’t take too long. You can ride this thing for many miles before you start to notice any slowdown. The LCD monitor is basic but it’s satisfactory. The speedometer can display either miles per hour or kilometers per hour, whichever you prefer. There’s a battery life indicator as well. 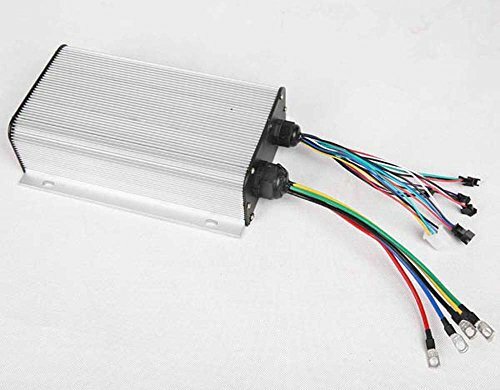 Connected to the left side of the screen is your motor controller for alternating between 1000w and 750w. The LCD screen itself has poor lighting and can be difficult to see during bright daylight or with sunglasses on. Considering the overall price of this conversion kit, it is still impressive to get one included at all. The twist throttle is made of decent rubber though it doesn’t provide the best grip. You’ll have to use it unless you happen to own another one. Fortunately, installation is very straightforward with Voilamart’s kit. The instructions are crystal clear and separating the wires extending out of the controller is easy and minimizes clutter and tangles. Each wire is very easily identified and simple to plug into their correct spot. 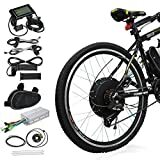 All in all, this is a solid electric bike conversion kit that would be a great choice for people looking for their very first set or who are on a budget. We lament the lack of a battery and compatible charger but hopefully, buyers will make do somehow. 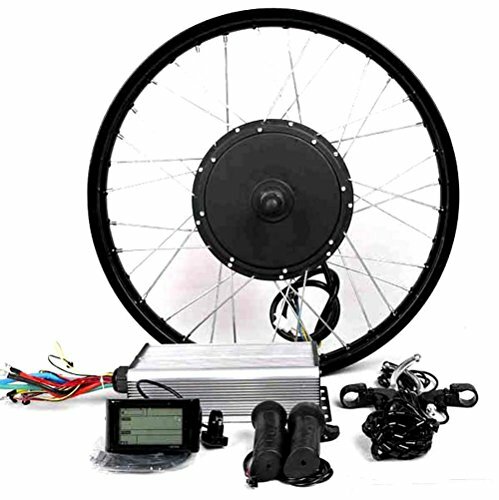 The 3000 Watt Conversion Kit from theebikemotor is an incredibly powerful electric bike kit that can reach top speeds of 50 mph. 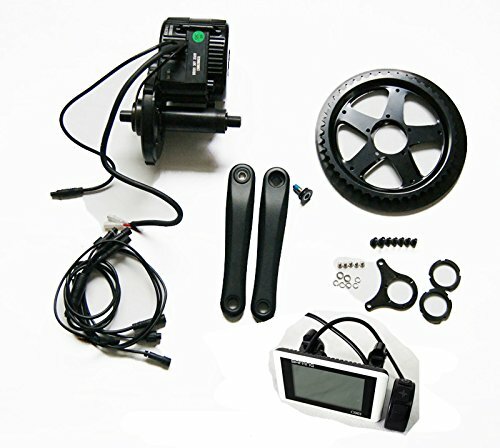 The kit includes the motorised wheel, motor controller, brake lever, throttle, LCD or 3.2" TFT display(it comes with LCD display if you don't choose TFT Display for the style option), Disc Brake & single speed gear if you don't choose the 6 or 7 speed Gear. No battery included! 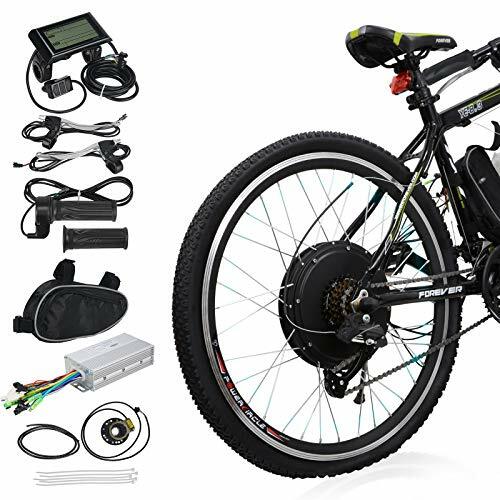 Our next electric bicycle conversion kit comes with several extra features for the rider looking for a more complete experience for the extra cash. We’re looking at theebikemotor’s Hub Motor kit, but it’s a specific variant of it. Theebikemotor offers a wide variety of options to pick from to customize and tailor your final product. The one we chose to review is the 72 volt and 3000 watt option with the included LCD screen. The final price is determined by what size wheel and what speed gear system you choose. One of our favorite things about this kit is the included disc brake system. This feature is included by theebikemotor even if you happen to opt for different customization. The downside of this is that it makes installation a little longer and more complex and it doesn’t come included with the 6- or 7-gear switch system. 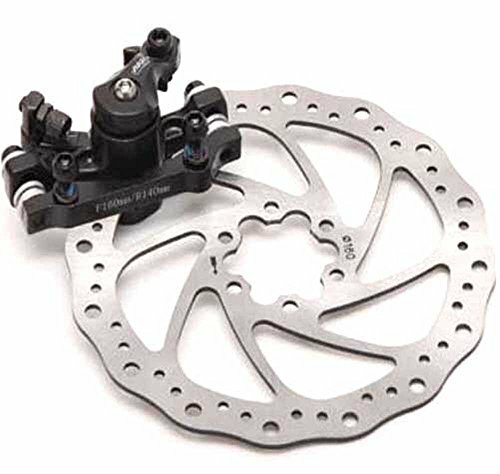 We consider this a worthwhile compromise as disc brakes are a valuable asset to bicycles. With the chosen 3000w motor, this conversion set can reach an impressive top speed of 50 miles per hour. With a speed like this, one can see why we chose to include the disc brake. These kinds of braking systems are very responsive and they are tough to wear down. Even when used continuously at 40-50 miles per hour, the disc brake on the rear tire can still be relied upon. The TFT LCD screen is of very high quality. What separates it from regular LCD screens is the superior backlighting and pixel quality. It is easier to read at night and daytime and causes much less eye strain. It will display your speedometer, battery life indicator, mileage and total ride time. No battery is included in any of the possible sets to this conversion kit. There is also no carrying case included which may be due to the fact that the controller included is a little big. It does feel sturdy but you will have to search for something if you want to give it extra protection. 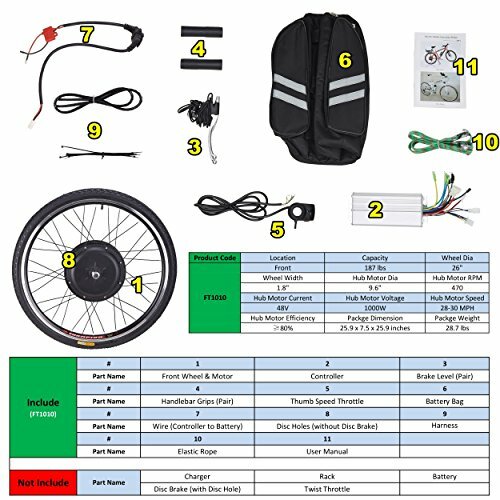 This is a set that’s geared towards more intermediate level electric bike users. If you are purchasing your first set then you might find the installation and lack of a battery and case too much of a hassle. But if you know what you’re in for due to prior experience then you’ll be rewarded with a very fast electric bike conversion kit with great brakes and good hill climbing capabilities. 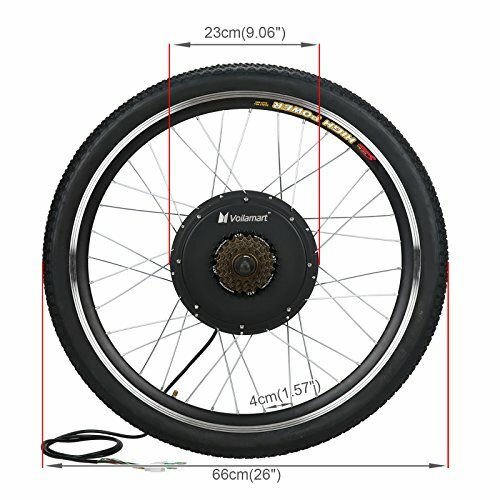 The Pinty Conversion Kit is an extremely affordable and simple conversion kit that is suitable for beginners and can be used as a front or rear wheel. 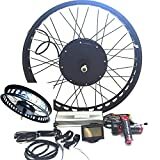  【Easy to Convert】 DIY front wheel ebike conversion kit for bicycle with 0.39"x0.55" axle and 26"(Dia)x1.75"(W) wheel. Easily convert your pedal bike into a motorized bike within 1-hour. 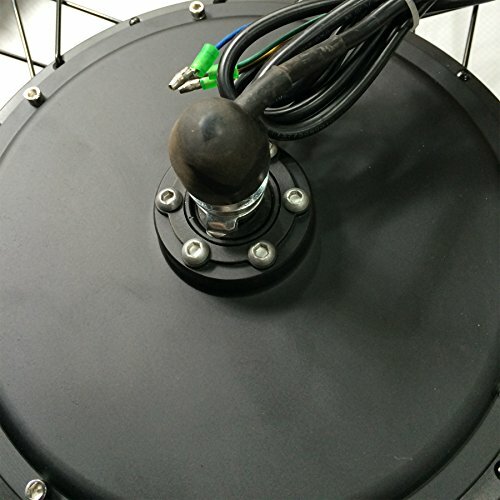  【Long Lifespan】 Use 48V 1000W brushless hub motor, operate with little noise and have a long lifespan. Battery recommendation: Electro kinetic cell battery ( Li, lead-acid, NiMH battery etc.) featured in nominal voltage 48v.  【Super Cost-Efficient】 Drive system has no moving chains or gears, no friction, more efficient. speed up to 28-30 MPH, 470 RPM, efficiency ≥ 80% | 187 lbs capacity, 9.6" motor diameter.  【Complete Accessories】 Comes with all necessary accessories. Front wheel & motor, controller, brake level, handlebar grips, thumb speed throttle, battery bag (without battery), wire, disc holes (without disc brake), harness, elastic rope, and user manual. BATTERY and DISC BRAKE is NOT INCLUDED.  【100% Satisfied Warranty】 We offer you 100% risk-free satisfaction guarantee to let you buy with confidence. 1-year warranty, 100% money back or replacement. The Pinty conversion kit is one of the best kits for beginners to pick up due to the number of accessories it comes packaged with. If you want something that will be easy to install then this may be your best bet. While this Pinty set doesn’t come with its own battery, charger or brakes, the good news is that it is disc brake compatible. 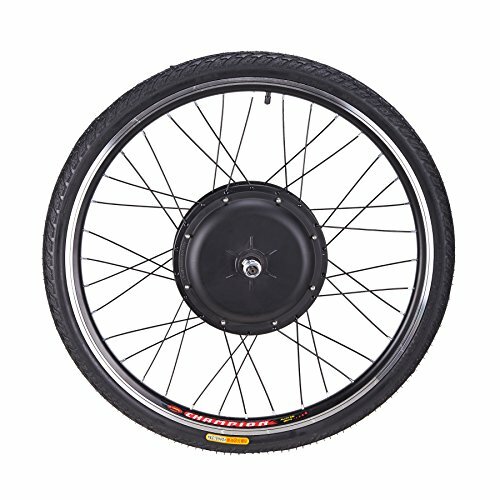 If your bicycle already has a rear tire disc brake then it will be easy to install after your electric conversion modification. And because this is such an affordable kit, getting a compatible battery shouldn’t be much of a hassle either. Lightweight is one of the words that could be best used to describe this kit. Everything from the controller to the thumb speed throttle is compact and easy to handle. The downside to this is that the weight limit is only 187 pounds so anyone above this limit will have to settle on another choice. With the 1000w dual motor control set up you can attain a max speed of 30 miles per hour. It also has really good battery life and surprisingly makes very little noise. It’s basically inaudible when riding outdoors. Pinty unfortunately doesn’t have an LCD monitor included in this set but for the cheap price we can’t blame them too much for that. The controller doesn’t have a plug intended for any screen displays but perhaps you could find your own third party device with a speedometer and the usual bells and whistles. The controller is of a very compact size although it does make the wires clutter up a little bit. It isn’t a big deal during installation, however. The carrying case is large and full of compartments. You could easily use it to store many other things. One may as well take advantage of the extra free space Pinty is handing out and pack it up with cargo. 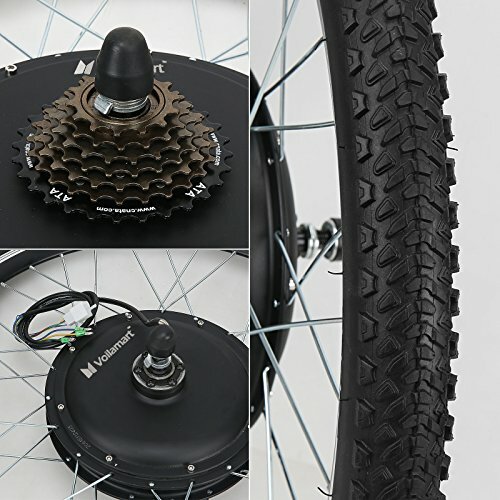 All in all, the Pinty electric bicycle conversion kit opens up doors to extra modification, be it with a stronger battery or responsive disc brakes. It’s quick to install and has a decent top speed considering the price range. The Bafang 8fun crank motor kit is the most challenging to install but also gives you the best and most reliable overall package and includes a battery. Our final conversion kit is also our most expensive one. This product by 8fun is a top of the line set that is not friendly to beginners due to the installation alone. It isn’t anything so complex that you have to be a mechanic or electrician but it does require specific bicycle maintenance tools that your average household does not possess. But if you can get past the price and the difficult installation you’ll have yourself an electric bike experience like no other. There are multiple things that make the 8fun Mid Drive so special and the first thing is the included battery. As long as the installation process can be, at least 8fun includes a 54v battery and it is a good one. The battery life is superb while also providing a stable 30mph top speed. If you want to go any faster without losing stability then you’ll need to use a stronger battery. We don’t know exactly how they pulled it off, but all of the components in this conversion kit are very lightweight. 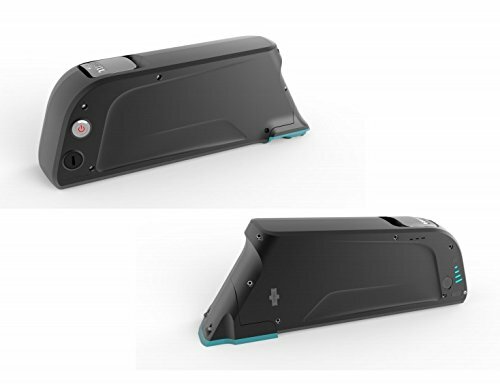 The combined weight of all included accessories is under 20 pounds, controller included. You could probably manage to fit both the battery and the controller into one bag and it wouldn’t even be an inconvenience thanks to how light they both are. The included LCD screen is made from a sleek and tough metal frame. The display itself is easy to read and displays all the usual information. It comes with two small clamps on the backside making it easy to attach to any handlebar. Because it uses clamps instead of straps it is very easy and quick to adjust. The motor included is very powerful despite being only 750 watts. It’s a crank motor instead of the standard ones we’ve seen previously, and it is arguably the selling point of this conversion kit. Crank motors are more powerful because they work in conjunction with the pedal chains as well as using their internal wattage. This makes them more powerful even at similar speeds. An example would be that even if a regular hub motor and a crank motor are operating at the exact same speed, the crank motor will still have better performance on all kinds of terrain, including snow, hills, puddles and more. 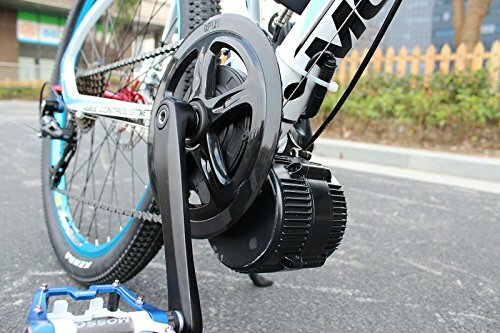 Hub and crank motors have their disadvantages but people who know their bicycles will already know which one they prefer. If you’re looking for a serious electric cycling experience that goes beyond regular commutes or bike trails then 8fun’s conversion kit will surely give you what you’re looking for. We’ve reached the end of our mega electric bike conversion kit article. If you made it to the end then thank you for taking the time to read our piece. We hope we’ve convinced you about the relative ease of installation and the convenience of electric bicycles if you were previously on the fence. All four of our selected conversion kits have their advantages and their downsides. Some are for beginners and some are for veterans but they all deserved their share of the spotlight. Hopefully you now have an idea of which one is right for you and are ready to make your purchase and take your bike to the next level. Enjoy your augmented cycling experience and be careful!